“When my wife and I met, I was living in rebellion. I was very young, we both were, and when I told my parents our plans to marry, they did all they could to change my mind. But instead, we eloped and my parents cut us off financially. A month after our marriage my wife was pregnant. The new baby, along with our financial stress and our estrangement from family, caused a lot of arguments. I was not walking with the Lord, though I knew Him, and my wife was an unbeliever. The fights escalated to abuse. We physically fought and there was a lot of emotional and verbal abuse as well. Even though my wife was very attractive, because of our arguing, she was no longer attractive to me. This affected our intimacy and took a major toll on our marriage. When I mentioned divorce I was surprised that my wife was all for it. When we made plans for her to move out, things actually improved a little—maybe because relief was in sight or maybe because we were finally agreeing on something. Just after she moved out and we divorced, I knew that I had made a mistake. I went to a Promise Keepers meeting and was deeply convicted. I knew I needed to be the spiritual leader of our home and I had failed miserably. When I spoke to my wife about my desire to be a spiritual leader and to get back together, she was totally opposed. I was shocked. I had not expected her to respond that way. The months of rejection that followed were very painful for me. But through this I knew that I had a call on my life and that I had been running from God for years. During this time I found a song that really ministered to me. It spoke of being a spiritual leader. One day I asked my wife if she would ‘just listen to it.’ She did, and it began to soften her heart toward me. We decided to move back in together. My parents were very opposed, so once again, they cut us off financially. I knew we should be married, but my wife did not see the need. During this time my wife became pregnant with our second child. This solidified my commitment to my wife and my family. I just could not imagine another man raising my children! It had to be me! A tragedy happened that really broke me and got me to the point of complete surrender to the Lord. A young man who I had known in high school had recently and radically become a Christian. Because of his talent in sports, he was well known. On the way to speak at an FCA (Fellowship of Christian Athletes) meeting, his plane crashed and he was killed. Somehow this tragedy brought everything into its proper prospective. Just two weeks later my wife and I were married again. We had a church wedding and invited family and friends this time. My wife is now a Christian who loves the Lord. She is beautiful on the inside and the outside. I am presently studying to go into the ministry. My opinion about and against divorce is really radical after living through all this. I am adamant against all divorce for any reason and believe people should remain unmarried with the hope of restoration. I believe that I will be able to effectively minister to those facing divorce, separation and rejection since I have been there. I honestly believe that this was all caused by spiritual problems that manifested in marriage problems. Once we get ourselves right spiritually our marriages will also be right. 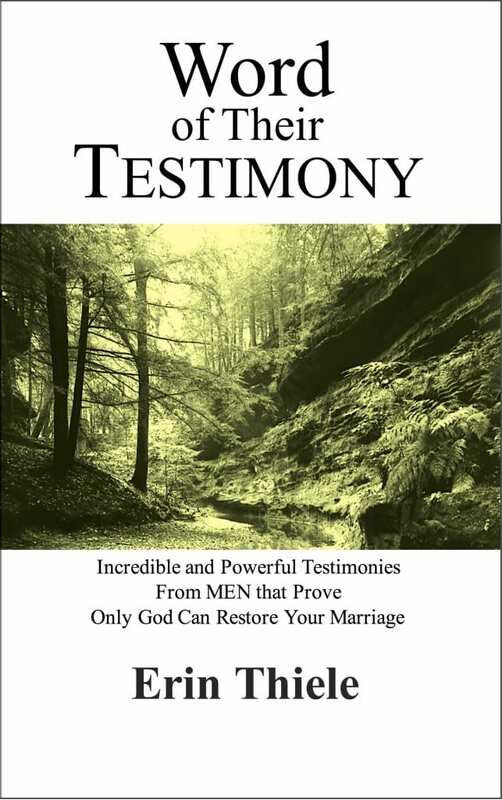 CLICK HERE to order your own copy to mark and read how others, like you, made it through their Restoration Journey and experienced a RESTORED MARRIAGE.